Extracurricular and co-curricular activities are an essential part of a well-rounded education. 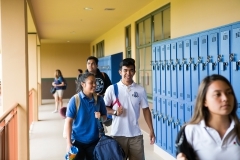 Kamehameha Schools offers a broad spectrum of activities for its students with opportunities to sharpen their skills in leadership, sports, academics, community service, culture, and the arts. These activities reinforce lessons learned in the classroom, allowing students to apply those lessons in a real-world environment. Following are just some of the ways we help foster academic success outside of the classroom. It has been 12 years since our Nā Hiapo Class of 2006 set out on their post high journey. With thirteen classes graduated, we now have over 1,700 graduates from our campus across the United States and around the world in post high endeavors and various professions. You are a part of our existence and our history here at Kamehameha Schools Hawaiʻi. We invite you to remain a part of our ʻohana as we, as a school, continue to strengthen the bridge between you and our campus. We extend our alumni service to you beyond your graduation from Kamehameha Schools Hawaiʻi. We want to hear from you, get your contact information, and invite you home as well as send you announcements pertinent to your pursuits. We acknowledge you as part of our campus growth. In the school year 2016-2017, Kamehameha Schools Hawaii High School added on a 5th year counselor position. The counselor following a student through to Grade 12 is given a fifth year with the students through their first year of college or other post-high endeavors providing support and information. In addition to this, Aunty Jodie Kimura and Aunty Shelly Cravalho-Wagner are continuing to support you beyond the 5th year with opportunities and alumni communications. Help us by staying connected by updating the following information through kshalumni@ksbe.edu.